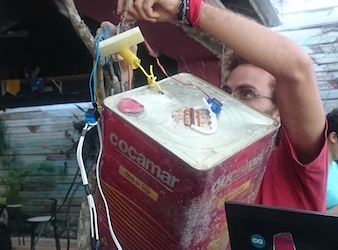 The Prediction Machine and Performing Data was presented at Tropixel Festival Ceincia Aberta Ubatuba (Open Science), as part of the Mata Atlantica Festival celebrations July 3rd – 5th in Ubatuba, Sao Paulo, Brazil. As part of this exciting week of workshops, talks, presentations and conversations I conducted an informal workshop that shows what happens behind the scenes with The Prediction Machine and presented the Performing Data Toolkit as a way to make experiments with live data streams. It was an opportunity to play with climate, weather and wave data. We set up our mobile weather station on a sign by the beach behind the cultural centre where the workshop took place and started bringing the data into the Performing Data WordPress Plugin (Timestreams). 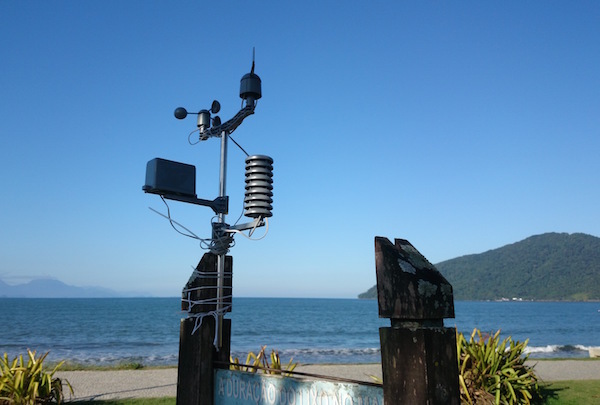 We then started hacking the technology that runs The Prediction Machine so that it worked in Portuguese and responded to the weather and climate in Ubatuba. The participants also made their own interpretations of the weather data we were collecting and made two performative installations – a music box that responded to the wind data and a shower that only worked when it rained and in response to the rainfall data – this was particularly relevant as there is an ongoing drought in Sao Paulo state. As part of this event I also spoke on a panel about open science. 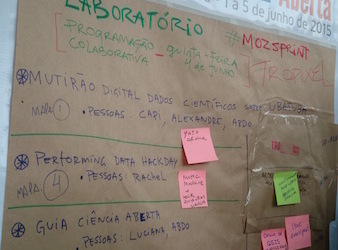 Tropixel is part of the open software and hackers movement in Brazil and this event linked with the Open and Collaborative Science Network in Brazil. 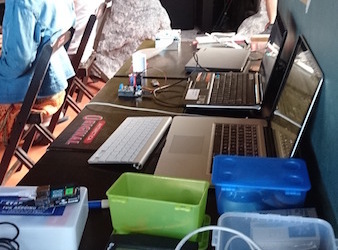 I presented demos of the Performing data wordpress plug-in that powers The Prediction Machine, small arduino examples that are controlled by live weather data from a weather station set up for the workshop, and the Hasting Pier Yun that brought wave data from the UK to the waves of Brazil. Presentations and a reception to open the exhibition will take place on Thursday 16th July. The Performing Data Project will be running a makers workshop on Friday 17th July where artists and hackers can get their hands dirty playing with weather, climate and wave data. Visit FACT’s website for more information.